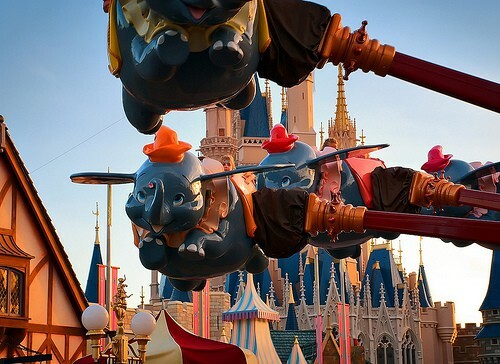 Which are the best Disney Magic Kingdom rides for toddlers? Visiting the most magical place on earth is great fun with kids of all ages but it is always best to be prepared so that you can know which rides everyone is likely to enjoy the most. 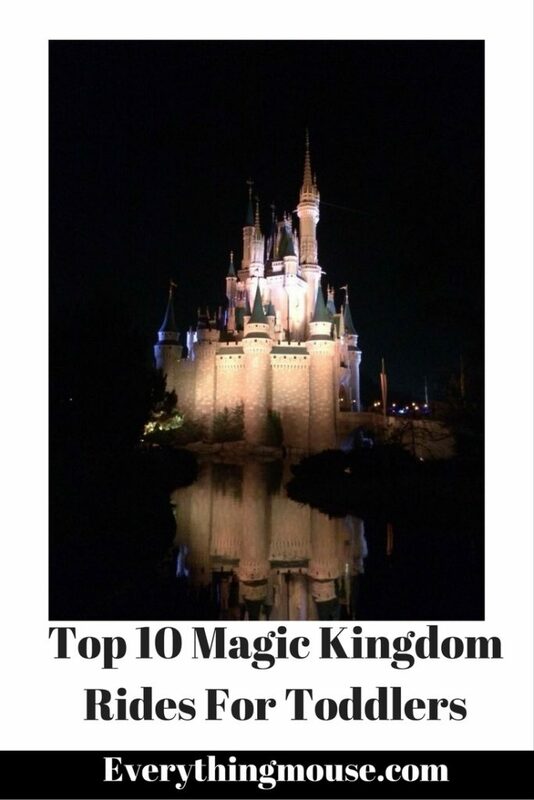 So here is my top 10 guide to the best rides and attractions that Magic Kingdom has to offer for toddlers. Most young children love Winnie the Pooh so this almost 4 minute ride will keep most of them happy. 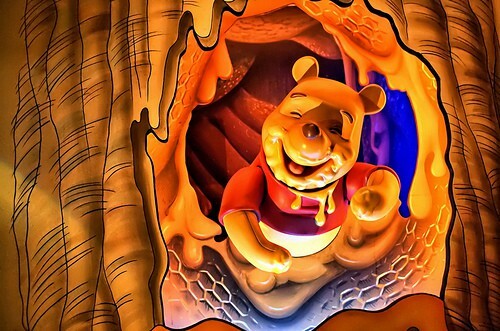 This indoor ride is very upbeat and is based on the story Winnie the Pooh and the Blustery Day. Children will see all of their favorites, Tigger, Eeyore, Piglet, Owl, and Rabbit in very bright colors. One of the best parts of the ride is the Winnie the Pooh dream sequence. This is one which all the family will love and is likely to be a favorite with very young children in particular. This is of course a popular ride. A Fast Pass is available (the machine is located close to Mickey’s Philarmagic). The standby line now has some interactive features to keep you entertained whilst waiting in line. Sometimes the simplest designs are the most captivating and this is certainly true of the classic carousel now named Prince Charming Regal Carousel. The ride was built almost 100 years ago it was purchased in 1967 for Walt Disney World. This attraction was for many years called Cinderella’s Golden Carousel but was renamed in 2010. Try and steer your toddler towards one of the inside horses. They move much slower than the ones on the outside. You can stand with your toddler if you feel that they are not balanced enough or confident enough to ride by themselves. Although the Carousel is quite slow to load the wait is not usually less than 30 minutes. 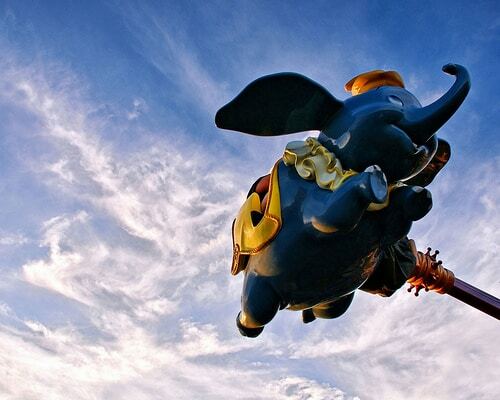 Your toddler is likely to say that Dumbo is his favorite ride in the world. This cute flying elephant is a wonderful ride for toddlers. 16 flying Dumbos spin around slowly on this 90 second ride. A Disney classic. There is only one problem with Dumbo. The lines. As this ride only takes 32 riders at a time and is very slow to load the line moves at a snail’s pace. Fortunately New Fantasyland introduced a second Dumbo Ride in 2012 so this has helped reduce the time in line. The Dumbo Ride is a whole lot of fun for all ages, but it you have a toddler is it definitely one of those “must do” rides. This is based on exactly the same ride design as Dumbo. It does have one very big advantage over the Dumbo ride though. Less time in line. The theme is different of course – you board a flying carpet and not a cute elephant – but the basic idea is just the same and your toddler will most likely love it. Riders can control the height of the carpet so as to avoid (or not) the lights sprays of water. 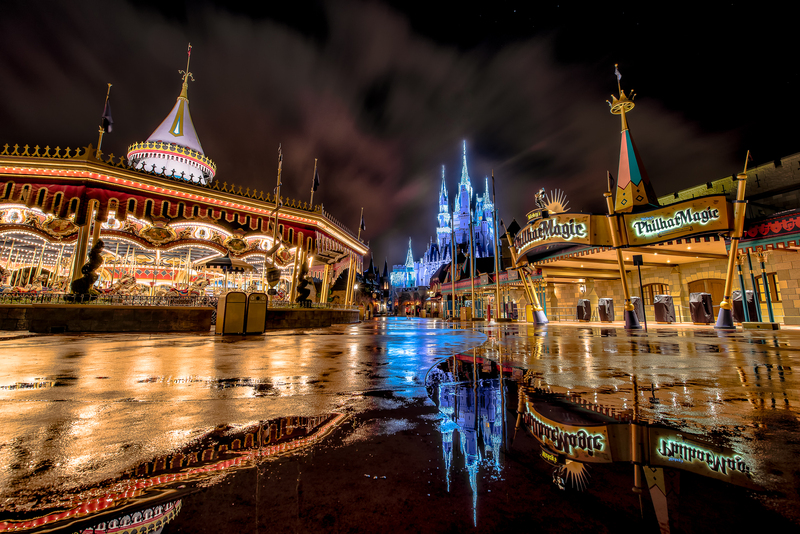 Like many of the other rides in Magic Kingdom it is a good idea to experience it both in the day and at night. It gives a very different feeling to it. One thing which we have particularly enjoyed is riding The Magic Carpets during the fireworks show. It is a very different way to experience the fireworks. The ‘happiest cruise that ever sailed’ is sure to be a favorite with your toddler. This 11 minute ride is one of the best known of all the Disney rides, and not just because once you have experienced it you will never be able to get that song out of your head! 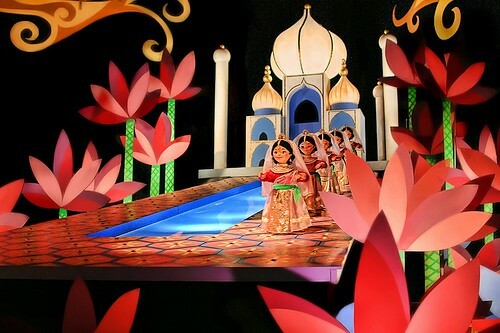 It’s A Small World is one of the original Magic Kingdom rides. Guests board a boat for this 11 minute ride past cute animatronic figures representing many countries around the world. The younger ones will also enjoy the additions of Disney movie favorites including Nemo and Ariel The Little Mermaid. It’s a Small World is also a great place to head in the middle of the day if your toddler (or you) need a nap. It is inside so a great place to get out of the sun for a while. Another very popular ride in Fantasyland which your toddler will enjoy. Guests board 2 seat pirate ships to be taken on a ride over the streets of London. The ride was designed for Disneyland in 1964 and is truly one of the classic Disney dark rides. Guests ride through scenes from Peter Pan and although the ride technology is far from sophisticated in this day and age, this is part of it’s appeal. 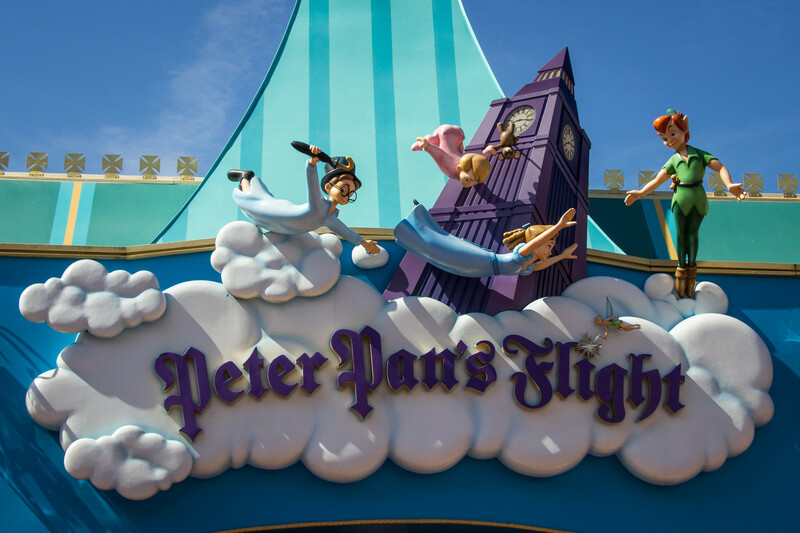 Unfortunately Peter Pan’s Flight line rivals that of Dumbo. You should aim to either arrive early and ride this first or pick up a Fast Pass. The line is not magical when you have been standing in it for 60 minutes with a toddler! There are Fast Passes available and this is one of those rides where we recommend you make use of it – particularly if you have a toddler with you. As with many toddler friendly rides this one is located in Fantasyland. This is a very entertaining show for all ages but toddlers will mostly love the characters, the music and the funny effects. Guests are seated in a 450 capacity theater to watch the 3D show. The story is that Mickey is late for a concert but Donald Duck tries to step in and help. Lots of Disney movies are referenced so there is sure to be something that your toddler recognizes. Usually the line for this is not over 30 minutes. Often you will get a surprise Fast Pass for this with your Winnie The Pooh Fast Pass. Young children love Toy Story so this will be a lot of the appeal of this ride for them. Guests board a 2 person vehicle and shoot at targets to get points. Your toddler is most likely not going to be able to reach the ‘laser gun’ very well so that part of the ride is not going to work well but usually they just love the activity and the colors. And of course Buzz Lightyear appears along the way. The Enchanted Tiki Room is an original Disneyland attraction and you can certainly say that it is showing it’s age. As an adult you probably want to experience it once just to see why everyone is saying it is outdated! But for a toddler it can be a favorite attraction. Young children will enjoy the upbeat songs and all the moving animatronic figures. For the grown ups it may just be a chance to sit down for 9 minutes and rest their feet! It can be a welcome break from the heat of the park and it’s another great place for a nap! 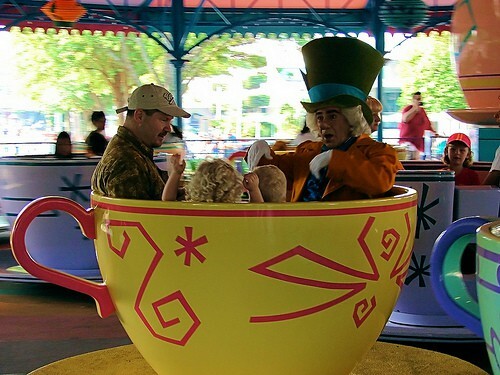 Toddlers love this spinning tea cup ride. Bright colors and a Alice in Wonderland theme will catch the attention of the little ones. Guests spin around in tea cups which they can spin faster and faster if they want to. Your 2 year old probably won’t be able to make a difference to the speed but your 5 year old certainly will want to make it go faster. 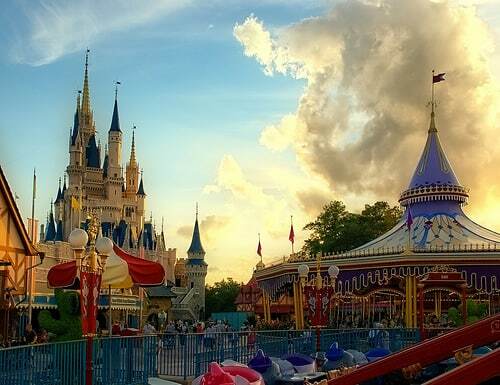 There is plenty to keep your toddler very happy in a visit to the Magic Kingdom. There are certain rides that they can’t go on of course but that does not mean that the older children and grown ups can’t go on these attractions. Where there is a height requirement there is always a Child Swap option. This means that all the family can stand in line and then one waits with the child whilst the other rides, and then the non riding guest swaps and rides the attraction. This is available at Splash Mountain, Space Mountain and Bit Thunder Mountain. 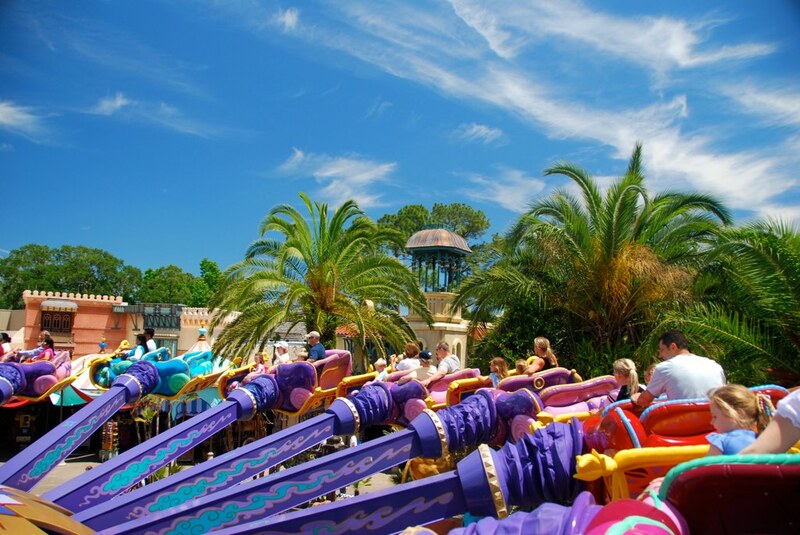 Do you agree with the rides chosen for the top 10 Disney Magic Kingdom Rides for Toddlers? If you have your own suggestions and tips for visiting the Magic Kingdom with toddlers then leave me a Comment below.